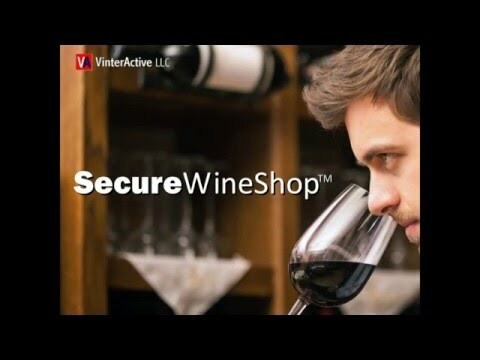 VinterActive's SecureWineShop™all-in-one wine sales software helps you sell more wine by accepting secure payments via website, smartphone, tablet and even your Facebook page. This proven cloud-based ecommerce solution is PCI-DSS validated and uses tokenization technology to maximize customer security, reduce liabilty and simplify reporting requirements. Based on more than a decade of wine industry experience & customer feedback, SecureWineShop offers a shorter path to purchase, more powerful marketing features, and more advanced management tools than any solution available to the wine industry today. We began VinterActive with the goal of helping wineries succeed by leveraging the best practices of consumer direct marketing. Since 2002, VinterActive has served as a trusted partner to hundreds of U.S. wineries and our innovative approach to consumer direct wine marketing has helped more wineries sell more wine than anyone else in the business. What does it take to TRIPLE your tasting room sales growth? VinterActive’s latest VinQuest™ consumer direct sales report “Top-10 Best Practices for Tasting Room Sales Growth” will give you the answers you’re looking for! Based on results shared by 226 U.S. wineries, this exclusive report “Top-10 Best Practices for Tasting Room Sales Growth” ranks winery sales and marketing tactics based on tasting room sales growth. Results are grouped by winery size to identify the unique top-10 tactics and “hidden gems” used by small and large wineries across the country. Wineries using the powerful techniques revealed in this report TRIPLED their tasting room sales growth compared to average! Established in 2002, VinterActive LLC is a wine industry leader in the research and practice of consumer direct sales and marketing. VinterActive research is widely used by U.S. wineries, industry associations and policy-makers seeking useful insight into consumer behavior, customer preferences and industry best practices. VinterActive’s proprietary wine marketing techniques for building long-term customer relationships and increasing tasting room, wine club and online sales have proven effective for both large and small wineries across the U.S.
With POS, wine club, ecommerce, compliance, inventory tracking and reporting, VinterActive’s SecureWineShop™ offers the industry’s best value in all-in-one wine sales software. VinterActive’s PreferencePro™ winery email marketing system combines drag-and-drop simplicity with superior deliverability and exclusive features such as micro-personalization, automated conversations, and AI-driven optimization to help you maximize sales results. And VinterActive’s annual VinQuest™ DTC Wine Sales Report offers unique insight into the performance benchmarks and best practices reported by top wineries across the country. When you complete the VinQuest 2019 DTC Wine Sales Survey! The VinQuest 2019 DTC Wine Sales Survey is now open along with your chance to receive FREE wine marketing research when you complete this confidential survey by February 28th. To sweeten your reward, we're doubling-up your complementary DTC marketing reports! We'll include three essential DTC sales reports (Tasting Room, Wine Club, Ecommerce) from our 2018 research as soon as you've completed this year's survey. Then we'll send the results of the 2019 survey as soon as they're ready. If you like learning about the best practices and benchmarks reported by top-performing DTC wineries across the country, we've got you covered, now & later! The EARLY BIRD catches two bonus VINQUEST MARKET RESEARCH REPORTS! Our annual VinQuest 2019 Consumer Direct Wine Sales Survey is now open! Now in its 12th year, VinQuest research is conducted by wine industry advisors VinterActive LLC in partnership with Wine Industry Network and leading winery associations across the country to provide valuable insight into consumer direct wine sales trends. Unique in scope, VinQuest is the only research to measure tasting room, wine club, and online direct sales at a national level and identify the best sales and marketing practices reported by top performing DTC wineries. Your interest and the involvement of hundreds of wineries just like yours has made VinQuest one of the largest and most widely used sources of consumer direct sales information in the U.S. wine industry. Once again this year, we're offering a free copy of our research results -- retail value $149 -- to all U.S. wineries that complete this confidential survey. EARLY-BIRD BONUS: Participating wineries who complete their survey by Jan 1, 2019 also receive two bonus reports -- "DTC Regional Benchmarks" and "Top-10 Practices for DTC Wine Sales Growth". Your participation in this research benefits the entire wine industry and is greatly appreciated by all the wineries, associations and industry leaders who use its results each year. What it takes to DOUBLE your wine club sales growth this year! What does it take to DOUBLE your wine club sales growth this year? Based on results shared by 226 U.S. wineries, this exclusive report “Top-10 Practices for Wine Club Sales Growth” ranks winery sales and marketing tactics based on wine club sales growth. Results are grouped by winery size to identify the unique top-10 tactics and “hidden gems” used by small and large wineries across the country. Wineries using the powerful techniques revealed by this report DOUBLED their wine club sales growth compared to average! Visit VinterActive at Booth #703 where they will be exhibiting their latest generation of winery POS, wine club management, ecommerce, email marketing, and winery website solutions. With POS, wine club, ecommerce, compliance, inventory tracking and reporting, SecureWineShop™ offers the industry’s best value in all-in-one wine sales software. Their innovative PreferencePro™ winery email marketing system combines drag-and-drop simplicity with superior deliverability and exclusive features such as micro-personalization, automated conversations, and AI-driven subject line optimization to help you maximize sales results. And their annual VinQuest™ DTC Wine Sales Report offers unique insight into the performance benchmarks and best practices reported by top wineries across the country. When you visit, ask us for your FREE wine sales report “Top-10 Practices for DTC Wine Sales Growth,” enter our drawing for a $200 Amazon Gift Card, and our amazing #ExpoDeal – a $500 trade-in rebate when you switch to SecureWineShop™! Use our promo code (VIN703) for free access to the trade show floor! Register here. Bryan St. Amant of VinterActive LLC has been doing VinQuest research for more than a decade, producing data that illustrates which tactics have been successful for wineries seeking more direct to consumer sales. VinQuest 2018 Consumer Direct Wine Sales Report was created to help growth-oriented wineries succeed, utilizing this data. The more than 200 wineries surveyed are predominantly from California, with 18 other states represented as well. The wineries range from very small, producing less than 1,000 cases per year to very large wineries producing over 42,000 cases per year. St. Amant pointed out that the report has no great truths to it, to direct one absolutely to what will be the answer to increase direct to consumer sales. What it has is great data that is easily synthesized to show what would be the most beneficial, according to one’s viewpoint in the industry, to achieving one’s goals. Windsor, CA – May 2, 2018 – VinterActive LLC today announced their integration with its PreferencePro™ winery email marketing system and Persado’s AI-content generation system. The collaboration allows VinterActive clients to generate subject line content best predicted to boost performance and then review and deploy those subject lines directly within PreferencePro with only a few clicks. Now available for any PreferencePro customer, Persado’s innovative software includes subject line generation, emotional analytics, brand customization and trend analysis fueled by AI to help wine marketers make the right decisions on the best language to use for their campaigns. FREE TRIAL - Now available for only $15/mo! On behalf of VinterActive LLC and Wine Industry Network, I'm writing to invite your participation in VinQuest 2018 - the U.S. wine industry's annual survey of consumer direct sales trends. Your interest and the involvement of hundreds of wineries just like yours has helped make VinQuest one of the largest and most widely used sources of consumer direct sales information in the U.S. wine industry. Now in its eleventh year, VinQuest is the only research to measure tasting room, wine club, and online direct sales at a national level and identify the best practices reported by top performing wineries of every size. Once again this year, we're offering a free copy of our research results -- retail value $149 -- to all U.S. wineries that complete this confidential survey by January 31, 2018. We're also providing free research results, including regional analysis, to all participating winery associations. Please forward this invitation to other wineries in your region to maximize the value of your free report. However you use the VinQuest 2018 survey results, we hope this research will stimulate your thoughts and help your winery perform at its very best next year! Direct to Consumer sales continues to be wineries’ most profitable revenue channel and in many cases, the only channel. However, developing a strategy that optimize sales, customer acquisition, and retention can be difficult without a solid dataset to benchmark performance against. Now in its 11th year, VinQuest research conducted by wine industry advisors VinterActive LLC in partnership with Wine Industry Network and leading winery associations across the country, collects and analyses key DTC performance data to provide valuable insight into consumer direct wine sales trends. Detailed DTC sales results from every winery size and U.S. region. Best practices reported for tasting room, wine club, and e-commerce. Proprietary 2018 forecasts for tasting room, wine club, and e-commerce. The current VinQuest survey runs through January 31, 2018, and all U.S. wineries that complete this confidential survey by the deadline will receive a free copy of the research results – $149 retail value. Unique in scope, VinQuest is the only research to measure tasting room, wine club, and online direct sales at a national level and identify the best sales and marketing practices reported by top performing DTC wineries across the country. “While correlation is not causation, tactics associated with success offer valuable insight for wineries seeking to grow their DTC sales. In the past our surveys have revealed three to five things that the top performing wineries were doing to differentiate and market themselves,” says St. Amant. Employing these best practices can yield significant benefits with the last VinQuest report showing that the strategies developed by top performing wineries resulted in 50% higher than average growth of their DTC sales. Your participation in this research benefits the entire wine industry and is greatly appreciated by all the wineries, associations and industry leaders who use its results each year. Winery associations promoting the project with their members receive the research summary along with a special regional summary. (NB. the more wineries that participate from a region obviously results in better data to compare the region). Now in its 11th year, VinQuest research is conducted by wine industry advisors VinterActive LLC in partnership with Wine Industry Network and leading winery associations across the country to provide valuable insight into consumer direct wine sales trends. Your interest and the involvement of hundreds of wineries just like yours has made VinQuest one of the largest and most widely used sources of consumer direct sales information in the U.S. wine industry. Once again this year, we're offering a free copy of our research results -- retail value $149 -- to all U.S. wineries that complete this confidential survey by December 31, 2017. North Bay WIldfires: Need a Workspace? Vinteractive is safe at this time and is offering help to those in need. For the moment we also have a corner of our small Windsor office that could provide a temporary workspace for someone in need. Please contact us if we can help. SecureWineShop’s Wine Club Kioskturns any connected device – tablet, laptop or desktop computer – into a dedicated sales station that makes joining your wine club easier and faster than ever. Windsor, CA – June 2017– U.S. East Coast wineries face significantly different challenges and opportunities for consumer direct wine sales growth compared to their West Coast counterparts, according to the latest VinQuest 2017 wine industry research just released by VinterActive LLC. This year’s report features an exclusive new DTC Sales Performance Indexthat identifies best practices by rating 32 DTC sales and marketing tactics according to their relative impact on East Coast tasting room, wine club and online sales growth. The VinQuest 2017 online survey was conducted by VinterActive LLCin partnership with the Wine Industry Network from April 10 through May 15, 2017 in an effort to better understand the unique dynamics of U.S. East Coast DTC wine sales. Detailed wine sales benchmarks and best practices from top-performing wineries nationwide are showcased in our latest VinQuest 2016 Consumer Direct Wine Sales Report. Now in its ninth year, VinQuest research has produced one of the largest and most widely used sources of consumer direct sales data in the U.S. wine industry. This year’s VinQuest research offers a detailed comparison of tasting room, wine club and online sales at wineries of all sizes from 10 U.S. states. DTC technology trends were identified along with barriers to success. The 63-page VinQuest™ 2016 Consumer Direct Wine Sales Report provides detailed responses to all survey questions and proprietary performance analysis by price-point, region and winery size – including detailed regional averages for Napa Valley and Sonoma County wineries – at a cost of $995. The VinQuest™ 2016 online survey was conducted by VinterActive LLC with support from leading winery associations in an effort to better understand the size and dynamics of the consumer direct wine sales channel. Participating winery associations include: Napa Valley Vintners, Sonoma County Wine Road, Walla Walla Valley Wine Alliance, Paso Robles Wine Country Alliance, Temecula Valley Wine Growers and Lake County Winery Association. Initial guidance and support was provided by Wine America and the U.S. Federal Trade Commission. SecureWineShop’s powerful new Abandoned Cart Remindermodule gives you all the tools you need to identify abandoned carts, automatically contact their owners with any message you choose, and track the results of your efforts. Windsor, CA – January 11, 2017 – Consumer direct wine marketing leader VinterActive LLC today announced the first in a series of new features planned for its flagship SecureWineShop™ software in 2017. New lower pricing was also announced with SecureWineShop™ now available for $995 setup and $199/mo, making it the industry’s most affordable all-in-one wine sales solution. “We think even the smallest and budget-conscious wineries should be able to benefit from the latest wine sales technology, that’s why we’re lowering prices and adding more features than ever in 2017,” said VinterActive Founder and CEO, Bryan St. Amant. Combining winery ecommerce, wine club software, tasting room POS, wholesale accounts and real-time compliance in a secure cloud-based solution, SecureWineShop is designed to help growing wineries sell more wine while reducing management costs. SecureWineShop’s latest wine sales feature announced today is a built-in customer loyalty program which allows wineries to reward long-term customers with points for purchases that can be redeemed for special discounts, events and product offers. “Research shows that exclusive personalized offers are one of the most effective techniques a winery can use to grow DTC sales. That’s why we’re including this new feature at no extra charge for all SecureWineShop™ users,” said St. Amant. SecureWineShop fulfills VinterActive’s core mission of bringing powerful direct-to-consumer (DTC) wine marketing tools to the small and medium-sized wineries that can benefit most from their use. 1) Mobile optimization adapts to desktops, laptops, tablets and smartphones with responsive design. 2) PCI-DSS validation maximizes online customer data security and limits winery liability for security breach. 3) Wine sales dashboard combines results from every sales channel in a single management overview. 4) Personalized products and pricing can be offered to unlimited classes of customers – retail, wine club, wholesale and more. 5) Complete wine club managementincluding bulk order processing, email notifications and Fast Track wine club signup form. 6) Integrated mobile POS accepts cash or credit for tasting room and event sales. 7) Built-in real-time compliance including state-by-state volume shipping limits, DOB collection and TaxCloud sales tax services. 8) Works with any website including VinterActive’s new Squarespace™ winery websites. 9) Shipping, compliance and accounting integration with UPS, FedEx, QuickBooks and 3rd party fulfillment/compliance vendors. 10) Personalized customer supportprovided by experienced wine industry professionals. For more information, winery owners and managers are invited to learn more at www.vinteractive.com and schedule a free demonstration of SecureWineShop™. VinterActive LLC is a leader in the research and practice of consumer direct wine marketing. Founded in 2002, VinterActive’s team of direct marketing experts, wine sales advisors, and ecommerce system engineers have identified and developed proprietary techniques for increasing tasting room, wine club and online sales that have proven effective for both large and small wineries seeking to maximize their share of the consumer direct sales channel. VinterActive’s wine industry innovations include PreferencePro™ email marketing, SecureWineShop™ ecommerce, the VinQuest Consumer Direct Wine Sales Report and SecureWineShop™ all-in-one wine sales software. VinterActive, SecureWineShop, PreferencePro and VinQuest are trademarks of VinterActive LLC. All other trademarks are the property of their respective holders. VinterActive LLC (www.vinteractive.com) in conjunction with Wine Road Northern Sonoma County (www.wineroad.com) will present a 1-hour seminar this Friday December 16th to share the benchmarks and best practices revealed in this year's VinQuest 2016 Consumer Direct Wine Sales Report. VinQuest research director and VinterActive CEO, Bryan St. Amant, will share DTC sales results and key industry averages for tasting room, wine club and ecommerce as reported by 224 U.S. wineries of every size. Common barriers to DTC sales will be examined and seminar attendees will participate in a crowd-sourcing session to address the #1 obstacle to DTC sales growth. Data from the VinQuest report will also be used to identify the best practices employed by tasting room, wine club and ecommerce managers at today's top-performing DTC wineries. As a bonus, all attendees will have the opportunity to receive a free copy of the VinQuest 2016 Consumer Direct Research Summary. This event is FREE and registration is open to members of the Wine Road association who RSVP by calling 707-433-4335. The VinQuest™ 2016 online survey was conducted by VinterActive LLC with support from leading winery associations in an effort to better understand the size and dynamics of the consumer direct wine sales channel. Now in its ninth year, VinQuest research has produced one of the largest and most widely used sources of consumer direct sales data in the U.S. wine industry. Windsor, CA –Consumer direct sales through tasting rooms, wine clubs and ecommerce continue to fuel the growth of thousands of small and mid-sized wineries in 2016, according to the latest VinQuest 2016 wine industry research just released by VinterActive LLC. Based on their VinQuest™ 2016 survey of 224 U.S. wineries, VinterActive reports direct-to-consumer (DTC) sales continued to grow at a double-digit pace in 2016 and was responsible for the majority of revenue generated by U.S. wineries producing fewer than 10K cases/yr. By correlating DTC sales growth with channel marketing practices, this year’s VinQuest report shows top-performing wineries in 2016 profited by targeting high-end consumers with limited-availability premium-priced wines and personalized customer service. “Private allocations, members-only products, customized wine club shipments and mobile optimized commerce were all winning strategies for DTC wineries in 2016,” according to VinterActive CEO, Bryan St. Amant. Pricing starts at $1000 set-up and $199/mo for VinterActive's SecureWineShop™ all-in-one wine sales software.